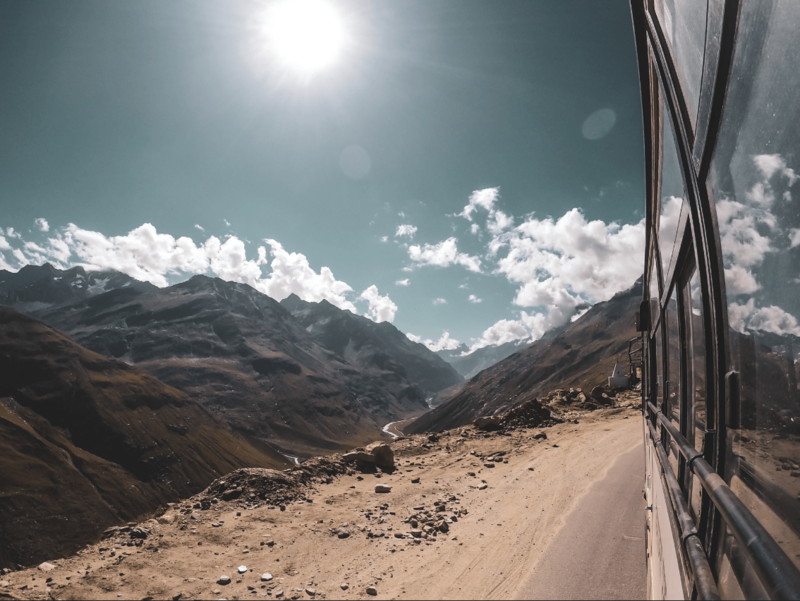 Like any other young traveller, I had a few must do’s in my list, and without much surprise, my list also included the vast, intimidating Spiti Valley of Himachal Pradesh with its naked treeless mountains and rubble for roads. And so, after seven months and nine destinations of travelling frequently, I finally decided to push myself further up (pun intended!) How this decision of going to Spiti came about, is a whole different story. After my initial plan of visiting Valley of Flowers in Uttarakhand failed due to excessive rains and floods, I was craving to be back on the road. Fast forward to a few days, and a friend I made through Instagram (talk about the community!) and I are planning a few days in Spiti. Little did we know, clouds would burst in various parts of Himachal causing floods and road blockages across the state. On the day I was supposed to leave, I was hit with news notifications telling me so and so roads have been blocked till the next day. I was left with two choices: postpone my plans for Spiti to some other time, or leave despite the bad weather warnings and pray that the Universe somehow gets me out of it alive. Surprise, surprise I chose the latter. It was a scary, and perhaps not the wisest decision to leave for Manali, in spite of the bad weather conditions. Schools were called off , vehicles were stuck for hours, and the road clearing work was in full swing but I felt a sort of inner calling that I had to be in Spiti, come what may. And boy, am I grateful I went! A message from the bus operator saying that the service will be delayed by two hours due to bad weather later, I could see what I thought were omens, even before I started my journey. And when I finally did board the bus, it started raining as soon as we exited Delhi NCR. To add cherry to the cake, I woke up to a heavy traffic jam in the hills somewhere in Himachal. All along, I was anxious about taking Mother Nature too lightly- something I had learnt to not do in these last few months. But the truth was I had started despite everything and now I could not turn back. So when I sat back and relaxed and left the rest to the Universe, it listened. The major road blockages including Mandi and Aut were crossed seamlessly thanks to the outstanding work of the BRO and the Army. A few traffic jams here and there, and one small active landslide later, we were able to touch down at Manali after only four hours of delay on road. As most of you might know, there is a full circuit one can do from Delhi to Delhi while visiting Spiti. 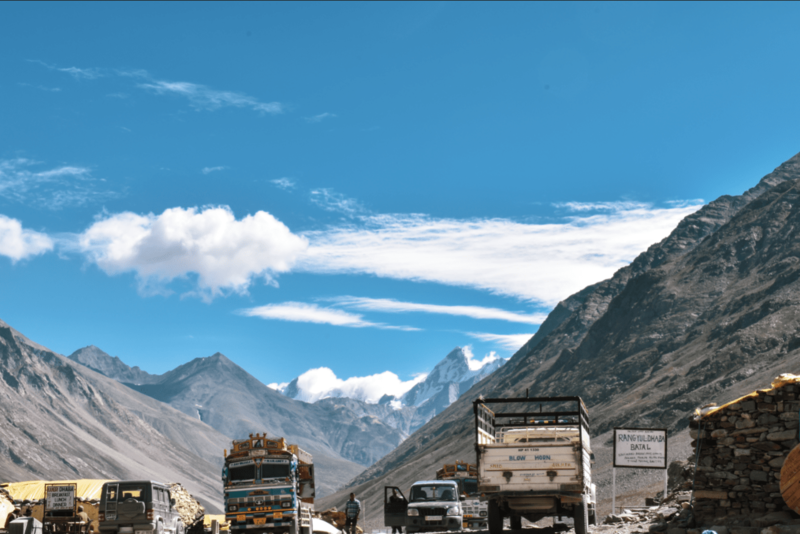 There is one route that goes from Delhi to Manali to Kaza, and the other is Delhi to Shimla to Pooh to Kaza. While the Shimla route is longer, it is supposed to be easy on your back. Because the Manali road is well, hardly a road! I reached Manali in 18 hours instead of 12 due to bad weather conditions, but that was better than the 33 hours that people had spent the day before. 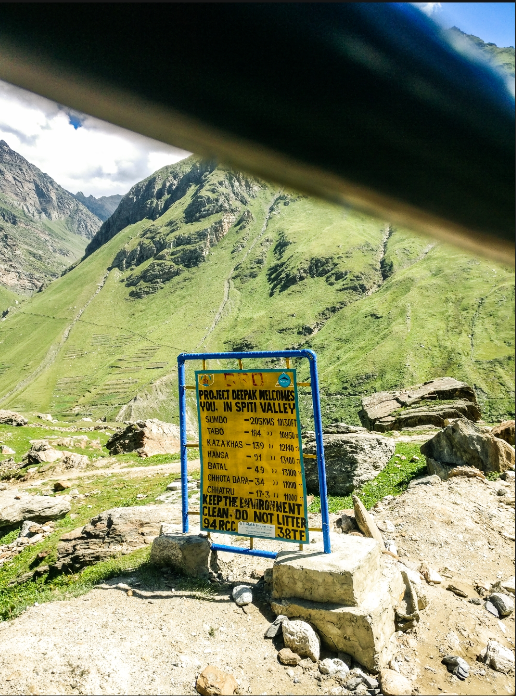 The first thing I did upon reaching Manali was rush to the BSNL office to get a SIM card, as there is absolutely no other network available once you cross Rohtang Pass. I then headed to Nomad’s Hostel in Nasogi where I had booked a bed for myself. It was a beautiful property surrounded by apple orchards. 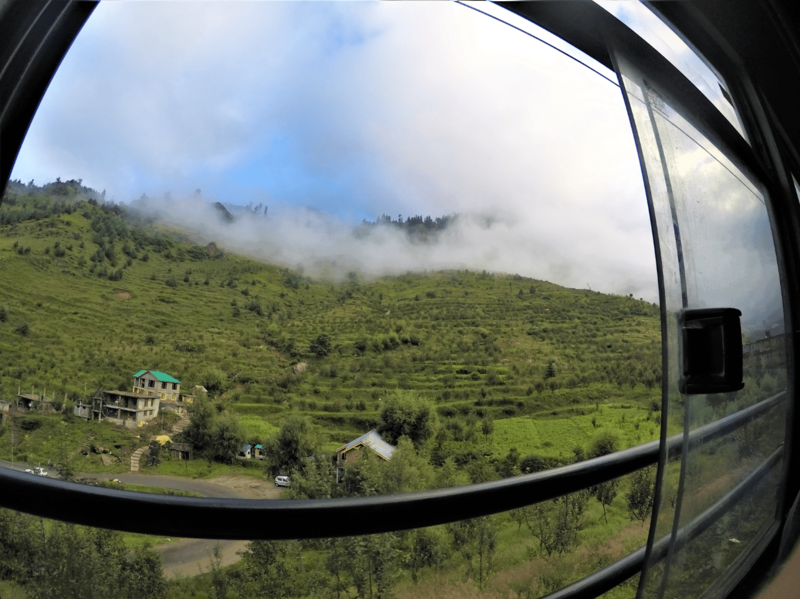 The terrace had a 360 degrees view of the mountains and you can even spot the famous Jogini Falls. But what was missing was a friendly host and a community like feeling but thankfully I was in Manali only for a transit night, and had a travel buddy. Had I been travelling solo, I would’ve had a tough time! I spent whatever little hours I had in Manali walking around and stuffing my face with the Bhagsu Cake at Moon Star Cafe in Old Manali. After my rendezvous with this dish in Cafe Illiterati in McLeod Ganj, I have become a fan! The next morning, I caught the 5:30 am bus to Kaza. 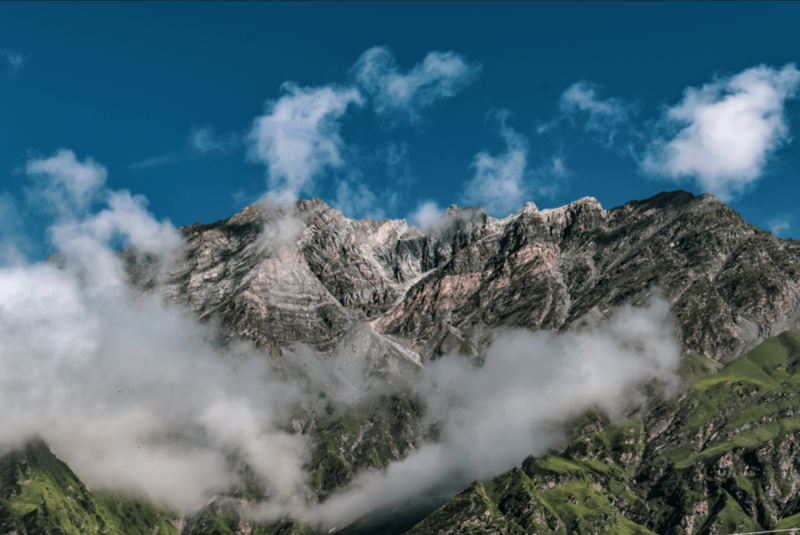 The sleep in me evaded as soon as we neared Rohtang Pass. I was surrounded by massive green laden mountains, touched lightly by the morning sun. I could not have cared less about the cold wind slapping my face but I had to stick my neck out, it almost felt like a compulsion. The image of the brown eagles soaring high against the white fluff of clouds on the farthest of peaks will never skip my memory. After a short breakfast break at Marhi, I noticed the tree line on the mountains started to recede. The green slowly started giving way to brown and the asphalt turned soon into dust. Within no time I was in Spiti Valley, with naked mountains all around me. The road was no more a road, but a bed of rocks on which the buss carried on its bumpy ride. One moment we were right beside the river bank, and the next so far off from it that the bus was almost dangling off a cliff. And by 1 in the afternoon, I was in beautiful Batal. Batal- where to stay, what to eat, and things to do. The bold heading that you just read is a scam and Batal does not exist! Batal is supposed to be a village but you can walk the stretch of it in a single breath. It only has a few dhabas, a rest house, a public hand pump, and a common toilet with no running water. It was honestly the best thing I had ever seen in my life! My privileged city self was so fascinated by the way the people lived here. I of course went in to Chacha Chachi Chandra Dhaba, perhaps the most famous thing Spiti has to offer, at least to the bikers. It’s a small little blue dhaba run by an ageing couple for the past 45 years, who call themselves Chacha Chachi. The village is situated on a river bank and makes for a great photo op. Much to our surprise, there’s no proper sleeping arrangement here. We teamed up with a couple from Malta and rented a small ‘room’ of sorts from Chacha Cachi for 200 rupees per person for the night. The room is built entirely of stones and has a tin sheet for a door. the floor has a raised cemented platform and we were given thin mattresses and quilts to sleep in. The cold windy night, coupled with the slight hit of AMS I was slowly getting turned out to be a very difficult night for me. Pro tip: To ward off the possibility of AMS entirely, start with a dosage of Diamox two days before hitting the high altitude. The pill also works as an SOS medication for AMS, but is not as effective. 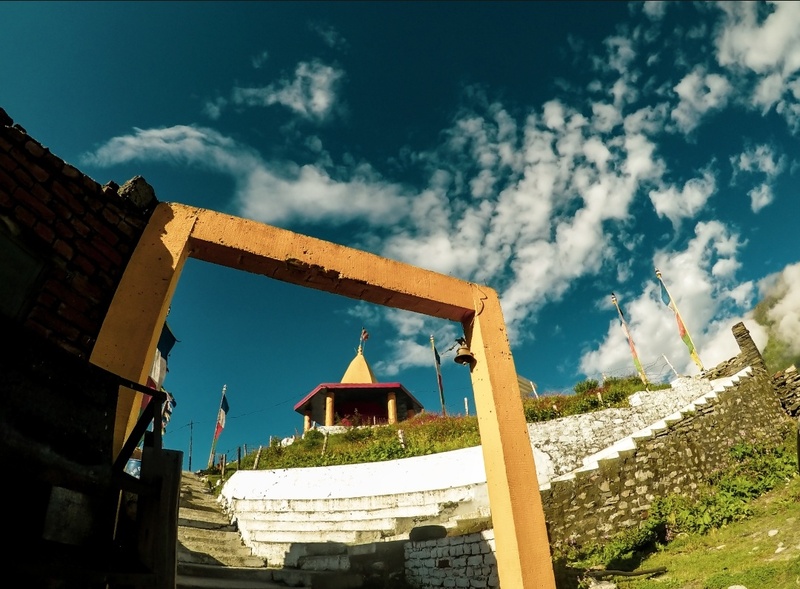 You have just reached the end of the first part of my Spiti series ‘serendipity’. Make sure you join my mailing list to be the first to know when the second part comes out! 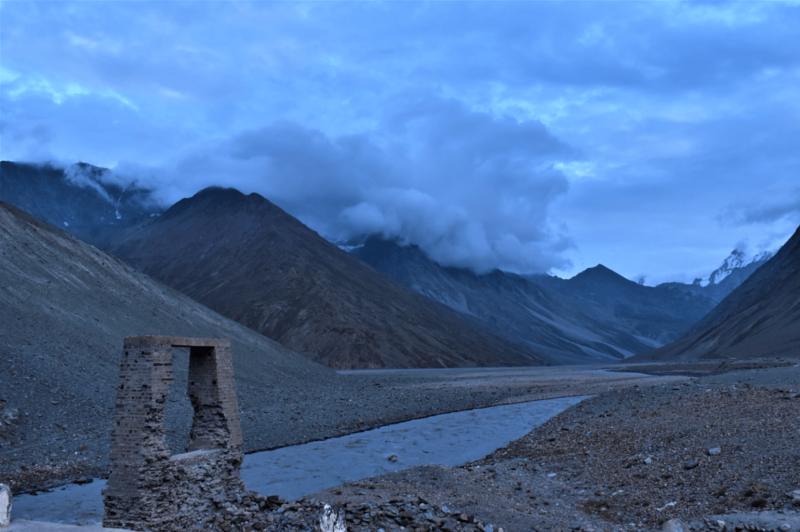 Spiti was the eighth of my ‘Twelve Months, Twelve Destinations’ mission. For more pictures and adventures from Spiti Valley and elsewhere, don’t forget to follow me on Instagram! Splendidly captured the beauty of Himachal Pradesh.